Wow! Pocket Aces 3 times in less then 1 hour. 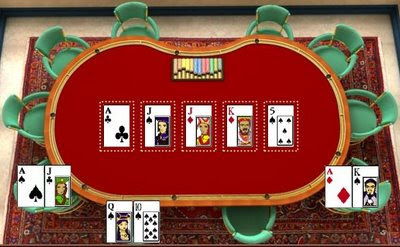 "I dont like playing against you.."
Fast night, played 3 hands! Solid Start To The New Year! 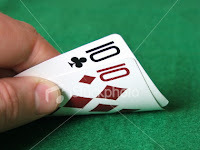 First bad beat: I have Q10 suited in spades in late position. I called $2. The button raises to $7. One other tight player calls, so I call. The flop is AJJ. Tight player checks, I check and the button checks. The turn is a King! I just hit the nut straight. The tight player bets $20. I think, did he boat? I just call $20. The button also calls $20. The river is a 5. The tight player bets $20 again. So I just call and the button guy re-raises to $70. The tight player folds, he says he has AK. Not my turn to decide... Only a boat beats me... there is no flush possibility. I have the 2nd but hand... 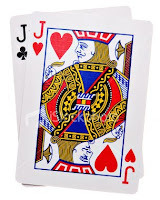 There is allot of big cards, its easy to have a boat with AA, AJ, KJ, KK, etc.. I call... The button rolls over AJ! 2nd bad beat: I am in the big blind. I have 74 suited in diamonds. It's an unraised pot of 5 callers. 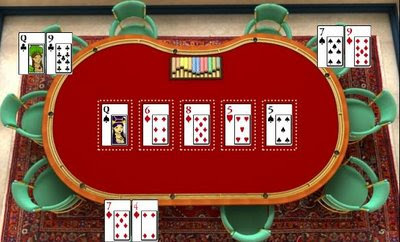 The flop is 68Q with 2 diamonds. One guy bets $10. I call and one other loose guy calls. The turn is a 5. I just hit my straight. I bet $25. One guy calls and the other guy re-raises me. I go all-in for another $30. The other guy is also all-in. I show my straight to the 8 with a flush draw. The guy that re-raises shows 79, a straight to the 9. I need to hit my flush. The river is a blank and I am busted out! So we finally get our new President. 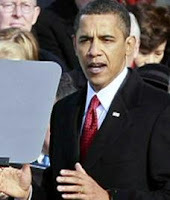 There is allot of excitement and fan fare about Obama. I admit that I did not vote for him, but I think we cant do much worst then Bush turned out to be. Bush was really disappointing and while I did not support Obama, I am glad he is our President. If nothing else, Obama will represent to the World that America can be truly great and compassionate. Obama does seem like a pragmatist and a centrist thinker. Yes, he is left leaning and has some liberal tendencies, but he may turn out to be more like Bill Clinton, "the best Democratic President a Republican can ask for." then like Hillary, which would have been far worst. The only thing that really bothers me is how the main stream media treats Obama. The media just love Obama! Yes, we all know that TV media are mostly left leaning, liberal Democrats but can't they try to be more objective in their reporting. The media cant say anything bad about Obama. But given the opportunity with Bush, they always portray bad news as negatively as possible with Bush. Now, I mainly watch the Business News Channels. So I always see the media always trying to correlate the stock market to political events. It is really crazy business if anyone really thinks there is a real direct relationship. But the media tries and whenever Bush gave a speech, CNBC would show the Dow Jones average and always say that the Dow "dropped" after Bush's speech. Yet, when Obama won the election and the stock market went down, huge!! The media was silent, only excusing Obama saying the market when down despite Obama winning because it was a "sell the news event.." and people anticipated the election and sold on the news, after he got elected. Well, look at the chart right after Obama won the election, the Dow was crashed over 1000pts.. and within 2 weeks it fell over 2000pts. 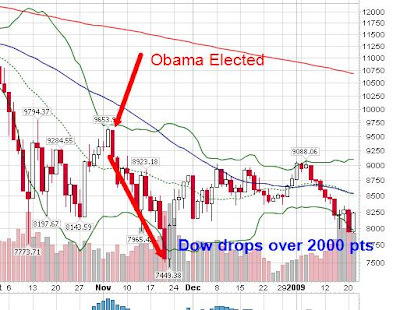 The market said very clearly that it is not in favor of Obama. I never mentioned the 2000pts drop during the summer when the polls where showing Obama winning. It's no secret that most Wall Street, stock market players are conservative Republicans and would prefer a Republican in the Office. So it should be no surprise that the market has gone down because of the fear of what a Liberal Democratic President would do. I have a simple theory to why the market started dropping since the Summer of 2008. It was seeing the Obama was winning in the polls and people in the market got scared. Democrats are typically anti-business and pro-government. So of course if you see this coming and have money in Stocks wouldn't you pull your money out too? Has anyone in the main stream media picked up on this observation? No.... Even on the day of Obama's inauguration the Dow drops over 300pts and still you see no headlines that the market is disappointed with Obama's Presidency. The media gives Obama a pass, but if Bush was still President they would say "the market tumbles on Bushes election".... Media bias, it has to stop! I sit down at my regular Friday night game and my very first hand, pocket Aces! I am the small blind and there is one limper. I raise to $13 and everyone folds. Less then 15 minutes later, I look down and pocket Aces again? I raise to $15 and everyone folds. Early on most players play very tight. Then maybe another 20 minutes later I see pocket Aces again! I can hardly believe it. So I raise $13 and get one caller. The flop is a few rags and my continuation bet makes the one caller fold. I think my total winnings with my three pocket rockets was like $25.. I'm not complaining, any win is better then losing.. I think I am now the white chip leader. For the second time in 2 weeks, the game breaks before 1AM. Everyone keeps busting out early and they start playing Ohama. I didn't feel my luck improving so I decided to keep what I made and left a winner! The guy that paid me off (bobby) was the same guy that I felted (busted out) the night before. I had pocket Aces and he had pocket Kings. I also made a full house on that hand. I guess I just have this guys number. Before calling my pre-flop raise of $15 he said, "I don't like playing against you.." He should have folded, but instead he had to play this AJ suited.. He hit top pair, top kicker, with a nut flush draw.. I guess anyone else would have played it the same way.. To bad I had the only hand that beat him.. It was an early end to last night poker game. I started late after traveling 3.5hrs from Dallas. I got to the game a little after 9:00PM and waited about an hour to play. I only played 2 hands I got doubled up to over $250. People were busting out early and before 1AM the game ended. I netted $200 for the session. I will take it. First hand was AK suited in spades. Some maniac raised $12. I smooth called. The flop is all rags, but 2 spades. He checks and I check behind him. The turn is a King. He bets $25 and I re raise to $50. He thinks then calls. The river is a blank. He checks and I bet $50. He folds and says "good hand.."
I almost double up and now have over $500 in front of me. I posted a solid start to the New Year! I went back to my normal Friday night place after taking all of December off. Between work, Vacation, the holidays and the girl I haven't been able to play all month there. It kinda felt strange going back. I had to check my records and while I did play allot of Poker in December, I did not play at my normal place, all month. I cashed out for exactly $500, net $300. During my last game of 2008 I actually posted a loss of $100. Nothing was really happening that night, I did have pocket Kings four times and Aces once, but no one had a second best hand to pay me off. Sometimes Poker works like this. So last night, I had high expectations to my game. Usually when I go on a cold run, my next game runs well. My mind set is its time to start hitting some sets. I haven't hit a set in ages... Well, they were hitting last night. My first hand was pocket Queens. I raise $15 and Jason and Eagle Eye call. The flop is AQ10. I bet $35 and Jason raises to $100. Jason is an aggressive player, (and helps runs the game) I put him on AK. I go all-in for another $20 and he calls. Jason did have AK and I double up. Now my stack is up a little over $300. Not sure what happens next, but for the next few hours I donk off about $120. I did try to bluff a few times and it didn't work. 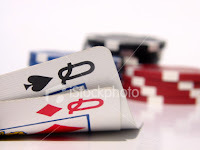 The moral to the story, bluffing doesn't work for me..
Then the sets just started hitting. Shortly after I hit a set of 444s, then a set of 10s, then another set of Queens. The table started playing round by round and I hit a set of Kings. Eagle Eye called me down with bottom set of sevens. It was a set over set hand! The board paired and we both boated. That hand made my night! I was checking out Martha's Zune one day, when I noticed that it had an FM radio built in. I was looking for a portable FM radio, so I could listen to the TVs where I work out. The fitness center broadcast the TV sound onto an FM radio station. None of the iPods have an FM tuner and while a few of the other off brand mp3 players do. So, I casually mentioned this to her that I might buy a Zune and we could share music too. Well, it was Christmas time and guess what, my girlfriend got me a Zune 120! It has 120GB of storage, more then my first 2 computers combined! It's a mp3 player like the iPod, but it's made my Microsoft with many more features. 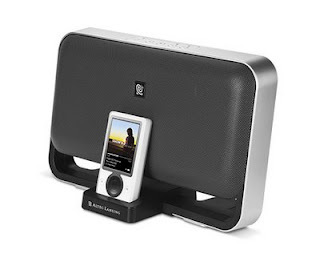 It is not as widely used as the Apple iPods, but works pretty much the same with some added features that the iPod does not have like a FM radio, the ability to share music with other Zune users and wireless sync capabilities. For a complete comparison report check out ZuneScene.com The site also has plenty to tips for new users. The Zune comes with little ear buds for listening. I decided that wanted to also get some real speakers to listen to the Zune with. Well, if you goto an electronics store you will notice that most of the accessories for the mp3 players are for the Apple iPod. There must have been 30 different types of speaker docking stations for the iPod compared to two for the Zune. Apple has done a really good job taking market share in the mp3 player space. I decided on the M604, by Altec Lansing. The list price was around $199. It seems like allot for some speakers, but it integrates with the Zune and also acts as a charger. I decided to look it up on Craigs List. I have had allot of good luck with finding anything I want there. Sure enough one guy was selling it for $110. I found it on another site for $50. The guy actually came to my office to let me test drive it. It worked great and sounded great! We settled at $65 cash. Gracis, Vero! You are the best!